ESTE PRODUCTO REQUIERE EL JUEGO BASE Anno 2205. Anno 2205: Frontiers is the final DLC to the City-Building Simulation developed by Ubisoft’s Blue Byte studio and lets players seize three new sectors - each featuring special sector projects and challenges. Also the new high-level Synthetics faction will be introduced which demands rare materials. 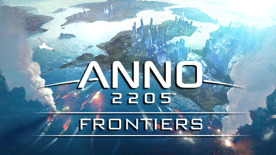 The Frontier DLC brings back elements from previous Anno titles such as multiple smaller islands in one sector and if players wish for, they can activate military conflicts in regular sectors. It’s the ultimate challenge for all players and completes the Anno 2205 journey. Offers traditional Anno flair in the temperate setting with lots of smaller islands to expand on. Players will uncover Shady Dealings and increase their World Market routes. This continental Arctic Sector invites players to travel the vast snowfields by unearthing geysers to gain new lands. The freed geysers can be used as a heat source for surrounding snow camps. Players awake the Man-Machine Synthetics, a new faction with high-level demands. In order to get into contact with the Hybrids, players have to excavate a precursor facility and bring it back to life. The new faction is a true challenge for all Anno experts. They will require lots of high-level materials, but mastering them will result in very effective workforces. Military missions can now be played in regular sectors. Players can call their fleet to fight hostile brigades and secure their trade routes. Unique ornaments which display players’ cooperation logos allow more customization options for the cities.